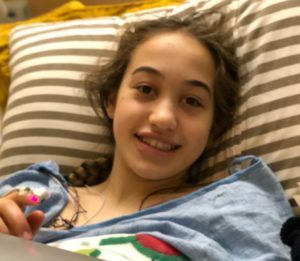 While visiting Mammoth Mountain over Christmas break, 14-year-old Cassidy Seitz of Hancock Park suffered a near-fatal heart attack while half-way up the Roller Coaster Express Chair #4. Thanks to the immediate response of the Mammoth Mountain Ski Patrol and lift operator, the young girl was treated immediately, stabilized and then transported to the emergency room at Mammoth Hospital. 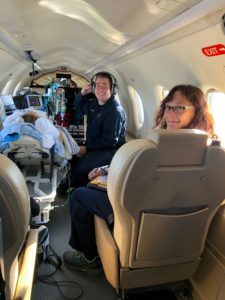 After being assessed and stabilized further at Mammoth Hospital ER, she was flown by the local medical Lifeflight service, ReachAir, to the Renown Children’s ICU in Reno. Within a few hours of reaching Reno, Seitz was then flown down to the Children’s Hospital Los Angeles. About 790,000 Americans have a heart attack every year and there a heart attack every 40 seconds in the U.S., according to the Center for Disease Control. Of these cases 580,000 are a first heart attack, with the rest having already experienced one. Cassidy was one of those in the “first heart attack” category. Heart attacks are very rare in young people (12-24 years old). Cassidy’s parents, Valerie and Jason, were completely unaware of any heart issues with their daughter, in fact, quite the opposite. She is very active, athletic and a well-conditioned gymnast. 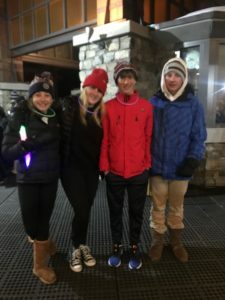 Cassidy was on the four-person ski lift with three close friends when she turned to 14-year-old Julianna Savagian—her best friend since the age of two—and said, “I’m feeling dizzy.” She slumped against her friend, unconscious. Her friends were not sure what was happening until they saw her ski poles fall from her hands to the slope below. Her friends, Colin, age 14, and Emmet Kneafsey, age 15, (the two are cousins), and Julianna, quickly acted to hold on to Cassidy and pull down the security bar so she would not fall from the chair. They frantically signaled the lift operator that there was an emergency as they came to the landing. Cassidy Seitz with her friends, 14-year-old Julianna Savagian,and Colin, age 14, and Emmet Kneafsey, age 15. The mountain’s ski patrol was immediately on top of the situation and, after finding that she had no pulse, applied an automatic external defibrillator (AED). It worked! After being transported down the mountain to the Mammoth Hospital Emergency Room, where she was further assessed and stabilized. She was the flown by ReachAir Sierra Lifeflight Medical Services to Renown Children’s Hospital in Reno, where she stayed for only a few hours before being flown down to the Children’s Hospital in Los Angeles. Under sedation, she remained unconscious for a full-day while doctors attempted to diagnose her medical condition. All the medical tests run on Valerie proved “normal.” Her mother said that the cardiologist treating Cassidy told her that the problem might be hereditary, i.e., an electrical problem with the heart. The Seitz family are effusive in their praise of everyone involved in saving their daughter’s life. 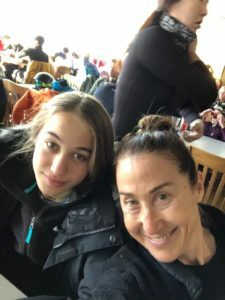 They were especially grateful for Cindy Dady, Mammoth Resorts Health and Safety Manager, who first contacted the family, and then kept them updated on her progress, arranged for transportation around town, and settled all their accounts from their stay (i.e., removed the charges). She also took care of the family while at the hospital and stayed in touch with the family for days after to check on Cassidy’s condition. They were very impressed with Mammoth Resorts. The Seitz family have been visitors to Mammoth Mountain for many years. Valerie said her husband proposed to her at the top of the Gondola and she had been snowboarding up in Mammoth when she was pregnant with her daughter, Cassidy. Cassidy has recovered and has already returned to school. Her gymnastics is on temporary hold pending further medical tests, but the family seems confident that she will be fine to return to the sport. Last weekend Cassidy’s father, Jason Seitz, was already back skiing in Mammoth with his 12-year-old daughter, Stella. What happened to the Seitz family is every parent’s nightmare, that something terrible might happen to their child. But in this instance, thanks to the extraordinary response of everyone involved on Mammoth Mountain, there was a positive, joyful outcome. Great to hear she is doing well.